Dovahlia is a family business located in Austin, Texas. The company was founded on a strong desire to incorporate more authentic and natural beauty care products into every day life. After testing and researching the market it became clear that there is no such thing as 1 brush fits all. Also, people have different hair textures and care needs. 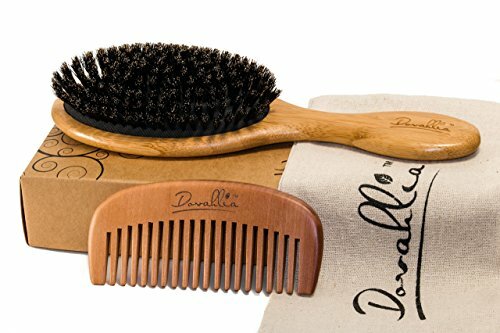 Pure Dovahlia Boar Bristle Brush is best for those that have thin, fine or normal hair and like gentle brushing while the scalp is still massaged. If you have full hair you must brush in sections. The brush comes with a wood wide - tooth comb for detangling and a travel bag. This way the set becomes part of your daily routine wherever you go. How to obtain best results? Pure boar bristle brushes are not for detangling; therefore, you need to detangle hair with Dovahlia wide-tooth comb. Let the hair dry and after that start brushing. Brush the hair in sections. When brushing, bend forward at the waist and flip hair over. Brush from the nape of your neck to the end of you hair. Remember to brush twice daily and you will see results. The manufacturer, Dova Direct offers 365 day guarantee. If you do not love this product simply contact the manufacturer for a complete no hassle refund. Add to cart now and enjoy your brush set! If you have any questions about this product by Dovahlia, contact us by completing and submitting the form below. If you are looking for a specif part number, please include it with your message.